The New Kokatat Men's Gore-Tex® Idol Dry Suit features a SwitchZip waterproof fully separating entry/relief zipper system. Features of the new SwitchZip zipper system: top can be worn alone as a dry top, no zipper on upper body, strategic zipper placement between backband and seat and you only have one zipper for both entry and relief! 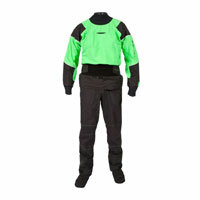 Made in the USA, the Kokatat Men's Gore-Tex® Idol Dry Suit is the best built drysuit, from the best materials available. Kokatat GORE-TEX® Idol dry suit from Kokatat Watersports Wear on Vimeo. From Eric Messner of Eugene, Oregon on 1/7/2016 .